YANNI'S GREATEST MUSIC PERFORMED BY THE WORLD'S MOST EXTRAORDINARY VOICES. WHAT THIS ALBUM MEANS TO YANNIThis album is about all the loves in my life! Never losing faith in humanity & our incredible ability to overcome just about anything we are challenged with. Its also about imagination, creativity, love, kindness, compassion, integrity, parents, country, peace, unity & belief & faith in our future. For international concert artist Yanni the year 2012 has already turned out to be an eventful year. For those who know the highly ambitious Yanni best, this is no surprise. Even now with a demanding concert schedule consisting of nearly day to day concert bookings with short breaks in-between, the celebrity music entertainer continues to produce new albums and concert DVDs that quickly become popular favorites. On April 11 at 1pm EDT / 6pm GMT, Yanni will be taking questions LIVE from fans and announcing additional exciting events for the coming year. Yanni and Lauren Sanchez are welcoming fans back into Yanni's studio to connect with fans. Yanni: Live at El Morro ! Countdown Begins.. Recorded LIVE at El Morro, Puerto Rico, “Yanni: Live at El Morro” will be released internationally at the end of March! and don’t forget to pre-order the album here:http://myplay.me/mcm! Begins airing on PBS - US Television Stations March 3, 2012. Check US local listing by clicking here. On December 16th and 17th, 2011, Yanni fulfilled a 20 year old dream to perform at the beautiful and historic 16th-century Castillo San Felipe Del Morro in San Juan, Puerto Rico. This once in a lifetime event features many of Yanni's classic hits, as well as several new pieces. Yanni's 10th PBS (US Television) special continues his tradition of spectacular productions spotlighting historical world monuments. The Castillo de San Felipe del Morro, better known as El Morro, is a 16th century citadel located in San Juan, Puerto Rico. Accompanied by his world renowned 15 piece orchestra, the show will feature the first televised performance of songs from his new album "Truth of Touch" as well as a new orchestration of the song "Nightingale." "I want to remind people of their potential for greatness," Yanni says. "I want to inspire as well as to entertain." Stay tuned for CD/DVD release information! Yanni's 2012 North American Tour is off to an incredible start. We have enjoyed wonderful audiences full of excitement and energy - but don't take it from us, click here to read a review from Howie Grapek on Yanni's first night of the tour. Fresh from a sold-out world tour, 2011's Top Selling New-Age Artist Yanni is returning to Mexico, United States and Canada with a brand new show for 2012! Experience Yanni and his world-class orchestra as they perform classic concert favorites and the live debut of Yanni's latest album, Truth of Touch. Rediscover Yanni's classic, Nightingale, as you've never heard it before. Pre-sale tickets are available now to members of Yanni's Free On-line Fanclub. Be sure to join YanniCommunity.com! Today NewAgeMusicWorld.com is one of the top New Age and World music website on the internet. New Age Music World is a popular international music blog devoted to exceptional artists, and the quality music they produce. Designed for those who share the same love of the very best music the industry have to offer, this site is committed to artists and visitors alike. This non-profit website is committed to offering defining insight into the diverse musical lives of today’s top New Age & World music artists by featuring in-depth artist interviews, album reviews, and current music news on a regular basis. The website covers a variety of musicians, from debuting artists just beginning their music careers to more established artists, and top music celebrities easily recognized in today’s international New Age and World music industry. News and review publications about Yanni are featured on a regular basis. International music celebrity Yanni has millions of fans worldwide, but what some visitors may not know is that in addition to the official Yanni.com website, there are a large number of international Affiliate Yanni websites offering exclusive news and original content about Yanni and his orchestra. In addition to other responsibilities, international affiliates lay an important role in Yanni’s world tours by orchestrating concert pre-show social events with fans. with India’s international affiliate website. The people at Yanni – India are a great group of people, which was my earlier experience with the public relations representatives at Yanni – Wake Entertainment. Knowing the entire organization is an outstanding group is something every affiliate team member can be proud of, plus it speaks volumes about the quality and dedication of the people Yanni selects as his domestic and international representatives. This international affiliate serves Yanni’s East Indian fans, along with all international website guests. Their website text is written in English, plus they provide a built-in Google dialect translator for many other languages.Featuring official news, press releases, and exclusive content, Yanni – India provides streaming music, and website links to the world-class musicians in the orchestra. They also post a bulletin of official sites, and provides an exclusive presentation of Yanni’s extraordinary 1997 Tribute Concert. 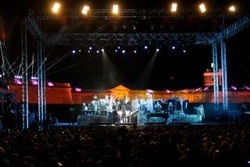 Yanni & Band finish Performing & Recording Live at El Morro in Puerto Rico !! El Morro in Puerto Rico was a special place for a Yanni Concert. It set the stage perfectly. Concert goers enjoyed a beautiful setting, high energy and a memorable evening. The concert will be aired by PBS and a DVD will be released in 2012. We are pleased to announce that we've added Mexico City, Mexico and Monterrey, Mexico to Yanni's upcoming North American Tour, "An Evening with Yanni." Yanni will be one of the first shows presented at the new state of the art Arena Ciudad de Mexico in Mexico City. Yanni Assists Flood Relief in Thailand !! Yanni Adopts a Baby Panda !! Chengdu Panda Research and Breeding Base (China) invited Yanni to become the adopted father and give the name for a recently born (2 months) baby Giant Panda. Adopting a Panda is an honor that is reserved almost exclusively for countries respected by China and Yanni is the first western artist to ever be honored with this gift. “This is a very heartfelt honor and is with great sense of responsibility to the people of China and the Panda that I accept this marvelous gift," said Yanni to an audience of dozens of media and supporters of the Panda Center in Chengdu. The adoption ceremony was followed with Yanni visiting the Panda birthing area where he visited his new baby daughter Panda, Santorini. “After careful consideration, I have chosen the name of Santorini for this baby Panda. The name Santorini is derived from the Greek word for “Peace," which is Irini. New episodes will air every Tuesday at 1pm EST / 5pm GMT on Yanni.com beginning this Tuesday, September 27th! Travel the world with Yanni and his crew as they perform for different cultures, experience the rich history of each country on tour, taste the wide array of ethnic cuisines and much more. Be sure to join Yanni's FREE on-line fan club at YanniCommunity.com to be the first to view each episode and experience bonus videos! Yanni's 2011 Release - Truth Of Touch Marks The Return of Yanni As You Know Him Best!! "Truly a passionate reflection of what Yanni does best." "Yanni is conceivably the greatest influential musician of our time." 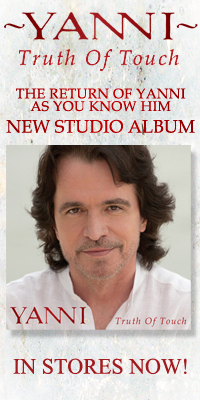 - "NewAgeMusicWorld.com"
"15 Piece Masterpiece" - "Hellenic News of America"
Yanni's Message to Fans !! learned so much from the many countries and cultures that I have been introduced to over the years. obligation to share what I learn with all of you." "Please know that the connection I feel with all of you is a bond I cherish dearly. Your comments, sharing how my music affects you - moves, touches and heals me more than words can describe. I learn so much from all of you. You are my continuing inspiration." Yanni Successfully Completed his Second LIVE Webcast from soundcheck at the Nokia Theater - Just before the show! Click on the Links below to watch the recording of the Live Webcast ! New DVD titled "Yanni ~ A Living Legacy" has been released on the 26th of April. The DVD features a compilation of hits from Yanni's previous concert video albums and includes performances from most of the spectacular locations where Yanni has performed throughout his career - all on one disk. In addition, Yanni brings you into his private studio to share some of the most memorable events in his career and his life. You can order now on Amazon.com. Click here to visit the Amazon store and click here to visit the Yanni Store. YANNI VOICES UPDATE ~ ENDER THOMAS' NEW MUSIC ALBUM !! YANNI PRESENTS ENDER THOMAS NOW AVAILABLE !! Yanni's featured vocalist Ender Thomas has released his new album "Yanni Presents Ender Thomas" under the label Yanni-Wake Entertainment on 19th April 2011. The album comprises of 12 songs and is currently available for purchase as MP3 on Amazon.com. Click here for purchasing now. Streaming Below is one of the new songs ~ "INDIA"
>> New Yanni Merchandise Now Available for purchase!! >> Yanni receives special Hoffman Estates gift. >> Yanni bringing a bit of a different sound. >> New "New Age" Yanni speaks the truth about his music. >> Yanni continues to explore new music territory. >> Yanni ready to take "Truth of Touch" on the road. >> Yanni to bring instrumental punch to Penn state. >> Billboard.com review of Yanni -Truth of Touch. >> Review -"Truly a passionate reflection of what Yanni does best." "Yanni is conceivably the greatest influential musician of our time." - "NewAgeMusicWorld.com"
>> Review - "15 Piece Masterpiece" - "Hellenic News of America"